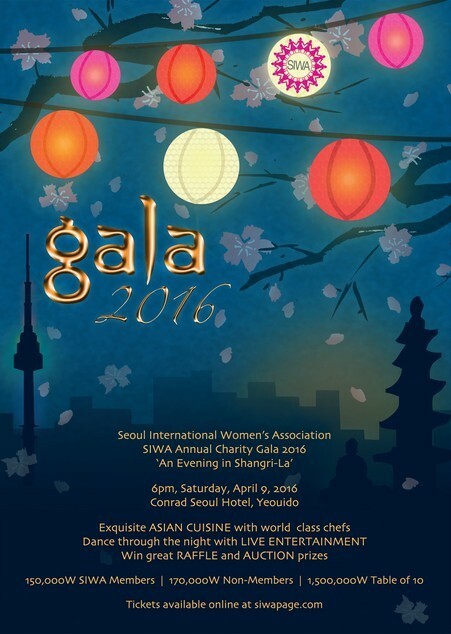 Seoul International Women’s Association will be hosting its Annual Charity Gala on April 9 at the Conrad Hotel in Yeouido, Seoul. Themed “An Evening in Shangri-la,” the event includes a cocktail reception, silent and live auctions and a four-course meal in aid of three charities -- Agit Sintesi, New Light Community and the Rainbow Community. And to keep guests fashion-forward, there will be a fashion show featuring award-winning Korean fashion designer Heill Yang’s couture brand of womenswear and menswear, HEILL. The show will unveil the label’s fall-winter 2016-2017 collection. To promote the giving spirit, Yang has also donated a gown valued at 3.5 million won ($3,000) and a skirt-jacket outfit worth 2.05 million won, from his spring-summer 2016 collection to the ball’s charity auction. The items will be made to measure for the winning bidder. “His fashion show will not only bring yet another level of glamour and elegance to the evening but will also add much to SIWA’s fund-raising efforts,” said Fitri Isenbeck SIWA’s public relations chair. Guests who want to show off their own style can enter a selfie competition. The best photo uploaded to Facebook will be awarded a 200,000 won prize. SIWA is an association of women from over 40 countries that has been around for more than 50 years. Fund-raising is a big part of their activities. The association runs a charitable fund that last year provided more than 133 million won to 22 Korean charities. “This year’s gala represents an opportunity for SIWA members to give back to their host country by recognizing three distinct charitable organizations that serve to alleviate some of the suffering for runaways, HIV-AIDS patients, and physically and intellectually challenged persons,” said SIWA president Anne Choe. AGIT Sintesi, which translates roughly to “the bus that cares for children,” is a project for homeless children that was launched nine months ago to provide food, clothes, counseling and entertainment for children living on the streets of Korea. “By supporting these children with basic necessities AGIT endeavors to preserve their connection to society and help them recover,” said Isenbeck. New Light Community is a shelter for people living with HIV-AIDS and their children. It has been running since 2000. Rainbow Community provides essential services for intellectually disabled people. Rainbow Community runs a child center, welfare center, sheltered workshop, group homes and speech therapy center. It caters to almost 1,500 people. Isenbeck said their success in running local community-based services instead of large, segregated residential facilities had influenced government policy. The SIWA Gala will begin at 6 p.m. with a cocktail reception and open bar, followed by a four-course Asian-fusion dinner served at 8 p.m. Live entertainment and an open dancefloor will round off the night. The silent auction will feature high-value items such as a Persian rug, Rosa K handbag, artwork and hotel stays, while the HEILL items will be sold in a live auction. To purchase tickets and for more information, visit siwapage.com/activities/events/siwa-annual-charity-gala-2016/.